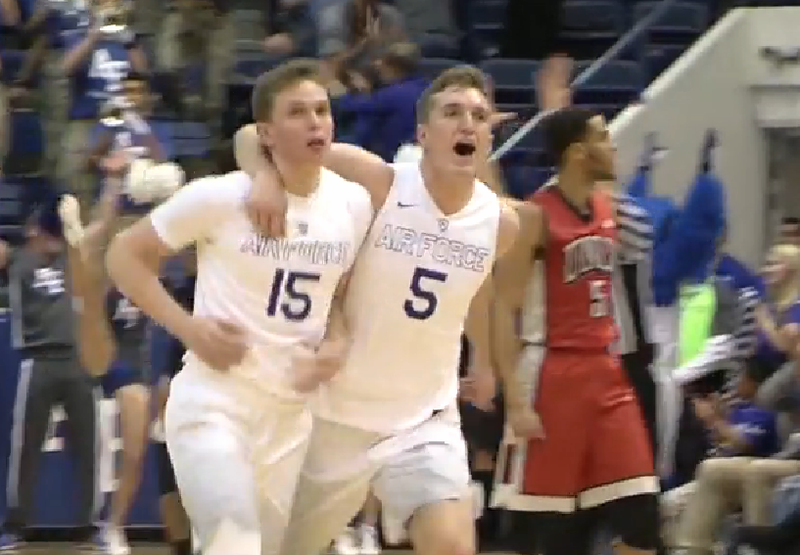 AIR FORCE ACADEMY, Colo. – There is some good news for UNLV fans after the Runnin’ Rebels took over sole possession of last place in the Mountain West Conference following a 81-58 smackdown by not-so-mighty Air Force on Wednesday night. Just six more days until spring football starts. The offensively-challenged Runnin’ Rebels dropped their eighth straight game in usual fashion, going almost 10 minutes without a field goal en route to another sub-40 percent shooting night (19-of-50, 38.0 percent). UNLV (10-18, 3-12 Mountain West) also committed 15 turnovers, many of them unforced, which Air Force (11-17, 4-11) parlayed into a 26-9 advantage in points off turnovers. This against a Falcons squad that entered with a six-game losing streak of its own. “Collectively I thought they were all really bad tonight,” UNLV coach Marvin Menzies said of his team. “I don’t throw them under the bus often so I think I’m allowed every once in a while to say the collective effort was not there. I don’t think trying to find a silver lining in individual play sends the right message to them or our fans. UNLV fell behind 14-4 in the first five minutes as Air Force guard Zach Kocur, taking advantage of some wide open looks, drained a trio of 3-pointers. But the Rebels, getting a boost from sophomore guard Jalen Poyser’s return from a one-game suspension, rallied to take a 26-24 lead with Poyser connecting on a pair of treys to spark a 14-4 run. But after Poyser’s second 3-pointer with 6:56 left in the half, UNLV went almost 10 minutes without a field goal. Air Force took advantage, ending the half on a 14-2 run to take a 38-28 halftime lead, then opening the second half with another 12-5 run to up their lead to 50-33 with 15:37 left. Things got even worse for UNLV after that as Air Force extended its lead to 27 points, 75-48, on a drive by Lavelle Scottie with 5:01 remaining. It marked the Falcons largest lead in a Mountain West game this season, easily surpassing a 15-point lead against Utah State on Dec. 31. Forward Hayden Graham led Air Force with 19 points and 11 rebounds while Kocur added 16 points, including 4-of-7 3-pointers. The Falcons, who also outrebounded the Rebels, 34-30, shot 47.4 percent from the field, including 14-of-26 from 3-point range (53.8 percent), and had 20 assists on their 27 field goals. Forward Tyrell Green scored 11 points and Jovan Mooring and Poyser each added 10 points to lead UNLV. The Runnin’ Rebels return home to host in-state rival and Mountain West co-leader Nevada (22-6, 11-4) on Saturday afternoon at 3 p.m. at the Thomas & Mack Center. Another loss for UNLV would match the school-record in that category.